I think it’s safe to say that so long as Disney has ownership over the Star Wars saga, we will never see a truly daring divergence from the original series. Now, that’s not necessarily a bad thing, especially for the ingrained fans who have this world memorized, collect all sorts of memorabilia, and even as adults, continue to dress up as their favorite characters. Few stories can spark this level of adoration and childlike effervescence. Star Wars is not just a film series though; it is a brand. And because of the fiery infatuation the masses show for this space opera, there seems to be a presumptive attitude as to what can / will / should occur. When you pull up to a McDonald’s in Maine and buy a Big Mac, you expect the same product the next time you order at their drive-thru in California. That’s the brand, that’s the product, that’s the expectation. This is Rogue One’s biggest hindrance; it can only divert from the beaten path and change the recipe when Big Brother isn’t looking. Young Jyn Erso is a stray. Her engineer father Galen (Mads Mikkelsen) was kidnapped by Imperial Director of Advanced Weapons, Orson Krennic (Ben Mendelsohn). Her mother became a galactic martyr. Later, as an adult, Jyn (Felicity Jones) must reflect on being left to spend her childhood raised and eventually abandoned by rebel leader Saw Gerrera (Forest Whitaker). Upon our initial meeting, she’s cuffed and under Imperial oversight; don’t ask why because there’s no real answer. The convoy is raided, she’s freed by Rebel Alliance officer Cassian Andor (Diego Luna) and his trusty droid K-2SO (a scene-stealing Alan Tudyk). After all of these years, The Empire has been forcing Galen to build the Death Star. It’s thought that Jyn can lead the Rebels to Gerrera, now a crazed old man holding Imperial pilot defector Bodhi Rook (Riz Ahmed) and his supposed message from Galen on how to destroy the planet killing weapon. Jyn agrees in hopes of seeing her father; Cassian plans to kill him so the Death Star can’t be completed. Rogue One’s first two acts left me rather cold, and too much time is spent jumping between new planetary systems and locations, its fingers tracing the entire map and its compass arrow spinning into disarray. Maybe it’s because I’m a bit of a Star Wars neophyte; maybe it’s because the film needed to be condensed. At over two hours, the story, so packed full of introductions and connections to the original trilogy (particularly through some of the most blatantly obvious and distracting CGI human recreations I’ve seen in a film…you’ll know exactly what I mean), feels like an elongated cliff-note. Regardless of how repetitive and echoed and xeroxed The Force Awakens seemed last year, that film still channeled an emotional connection, somewhat due to the script’s lineage, but mostly because it allowed Daisy Ridley to fully become Rey. With an Oscar nomination already under her belt, Felicity Jones can no longer be considered an up-and-comer. She has arrived. In Rogue One though, she’s not given the depth nor the opportunity to really explore the cracks and the crevices of this fearless rebel. There’s cause for me to wonder whether or not Gareth Edwards was the right director to bring this film to the screen, but that’s less his fault and more the studio’s. You can sense Edwards wanted to make this a standalone picture just from watching the third act, as it is a proficient, surprisingly shot and grounded saga mimicking the tactics of Vietnam era guerrilla warfare. Plus, the cast is varied and colorful, sporting tremendous supporting performances from the likes of Ahmed, Wen Jiang, and Donnie Yen as the blind believer Chirrut Îmwe. Hearing him repeat, “the Force is with me and I am one with the Force” in a world without a God is as close to prayer as you can get, like Dorothy preaching that there’s no place like home. And in a way, that embodies the full title of Edwards’ picture. When we’re hunkered down or soaring across galaxies, the film casts a spell of rejuvenation with a strong fighting spirit. 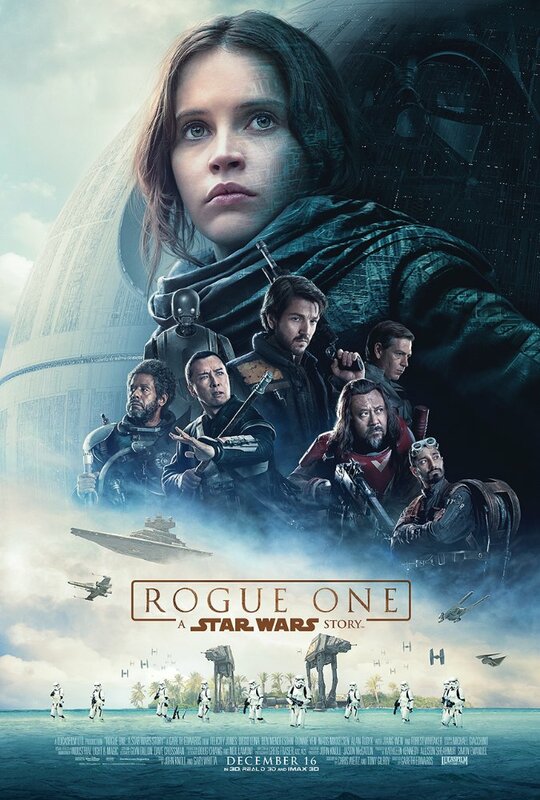 But when it’s not at war, Rogue One tries too hard to suckle baby formula from the Star Wars Story teet instead of sinking its teeth into something entirely new. I’m afraid that in this case, the originals are inescapable shrouds hung from a towering, looming nostalgic presence. Prequels always live in the shadows.